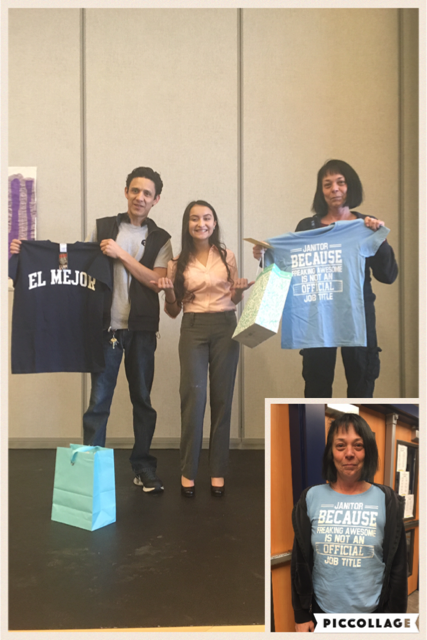 On Monday, February 6, 2017, high school student Monica Ibarra requested Israel Perez-Acosta and Kristen Hunter to join her on stage during lunch, to thank them for all the work they do for College Place High School. They each got a gift with a t-shirt customized specifically for them as well as a thank you card signed by each class' Presidents and Vice Presidents. The students sitting at their tables gave our custodians a roaring round of applause with gratitude for all they do. It was a short yet beautiful and meaningful moment for the students in CPHS and for the custodians, "It makes it all worth it" said Kristen Hunter after their recognition. "I hope that moment wasn't and isn't the only time we thank not just our custodians but our staff as well, for everything they do. It's not easy and they continue to stay with us, by choice, I think I speak for everyone when I say that our staff are a blessing!" mentions student Monica Ibarra. It was a wonderful experience and we hope to see more things like this in the future of our school!